Like marriage, nature conservation takes hard work and lifetime commitment. Through hosting sustainable and minimalist events for up to 150 persons, we hope to enable meaningful gatherings that bring people closer to each other and to nature. Through celebrating your wedding with us, you also contribute to the sustainability of the georeserve and our ongoing maintenance and reforestation works. Our event policy revolves around the fact that the georeserve is a sanctuary for plant and animal life. They are the rightful dwellers of this place, and we are mere visitors to their home. The features and structures within the georeserve were designed and constructed by our local craftsmen and engineers, and embody what is found locally and grown naturally. Cocooned within a dedicated multi-use zone of the georeserve, our venues let you experience a rustic and intimate weddings and events at our humble sanctuary. 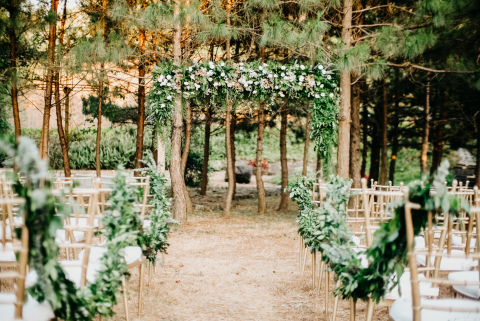 With a spectacular backdrop of the Masungi limestone formations, and views of Laguna de Bay, the Sierra Madre Mountain Range, and the Manila skyline, your special day is destined to be an inspiring and magical one for you and your guests.